Canadian Junior Samuel Beaudoin rode at his first World Championships last weekend, when he attended the Cyclo-cross Worlds in Koksijde, Belgium. Afterwards, we asked Sam if he would provide his impressions from attending the Worlds - what he takes away and how it will change his racing in in the future. Sam finished 50th in the Junior Men's race. Ever since I began cyclo-cross racing seven years ago, I have dreamed of racing in Belgium; the treacherous mud, the punishing rain, the unforgiving cobblestones, and the other ‘hardman’ conditions really mirror my idea of what a true bike race should be. 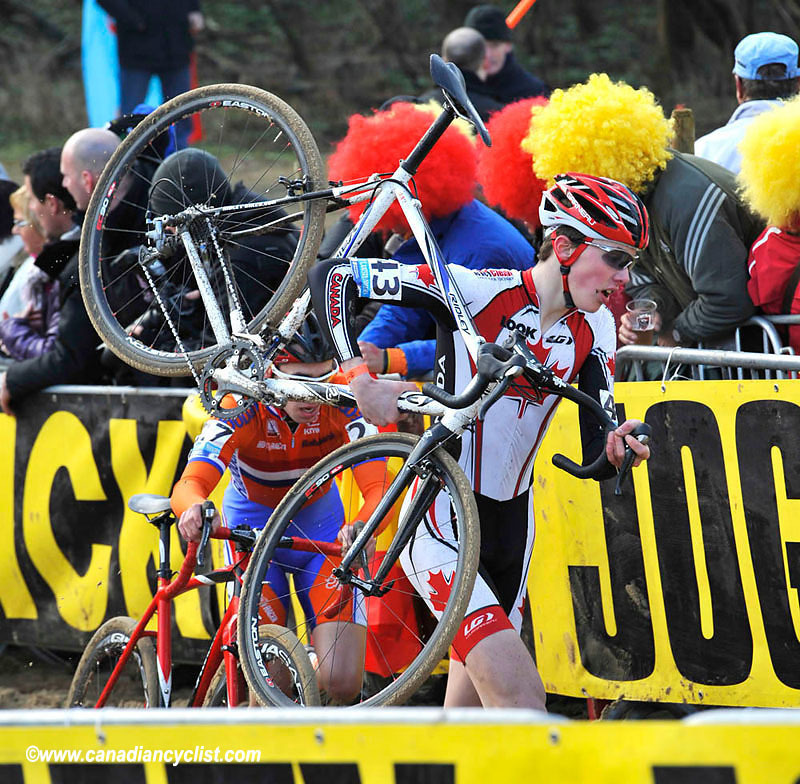 Of course, you can imagine my excitement when I was invited to compete for Canada at the 2012 Cyclo-cross World Championships in Koksijde, Belgium after my first race at the cyclo-cross nationals. My career-long dream was finally coming to life! My European experience started with the last race in the World Cup series: Hoogerheide WC, in Holland. As I arrived at the venue, I was quick to realize how serious Europeans take cycling, as well as the vast differences between competing in Canada and in the sport's heartland. In Belgium, the sheer size of the events, the competitors' unwavering attempts to pass you no matter what it takes, and the courses' requirements for both peak fitness and extreme technical ability initially overwhelmed me. Shocked and unprepared, I spent most of the race thinking about what was happening around me rather than concentrating on my performance. At the World Championships in Koksijde, Belgium a week later, I was better prepared, but still a complete rookie at racing in Europe. While I was able to focus a bit more on my performance, the lingering effects of a stomach flu slowed me down, as did my overzealous start. Combined, these two problems contributed to my being lapped and to an eventual 50th place finish. It is easy to get disappointed when you get lapped, but I think it is even more dangerous to get lulled into a false sense of satisfaction brought on by a “wow, I'm still 50th in the world!” mindset. It's easy to get overconfident, especially with all the support from the kind people across Canada and with the Belgians going wild for our maple leaf, and if you do let the praise get to your head, your training starts to suffer and your performances dwindle. I'm determined that next year, I won't let my race standing - good or bad - affect me. Instead, I will learn from my experiences, focus only on the straight facts and work with them. This year, there were people in front of me who need to be beat next year, and for me to accomplish this, I must adapt my training regimen to the European style of racing. Belgium might just be my favorite place on earth, so there won't be a minute this year where I will be able to forget how badly I want to be racing over there. Ironically enough, getting lapped was probably one of the most motivating things that has ever happened to me.